There’s a great smell coming from the microwave. 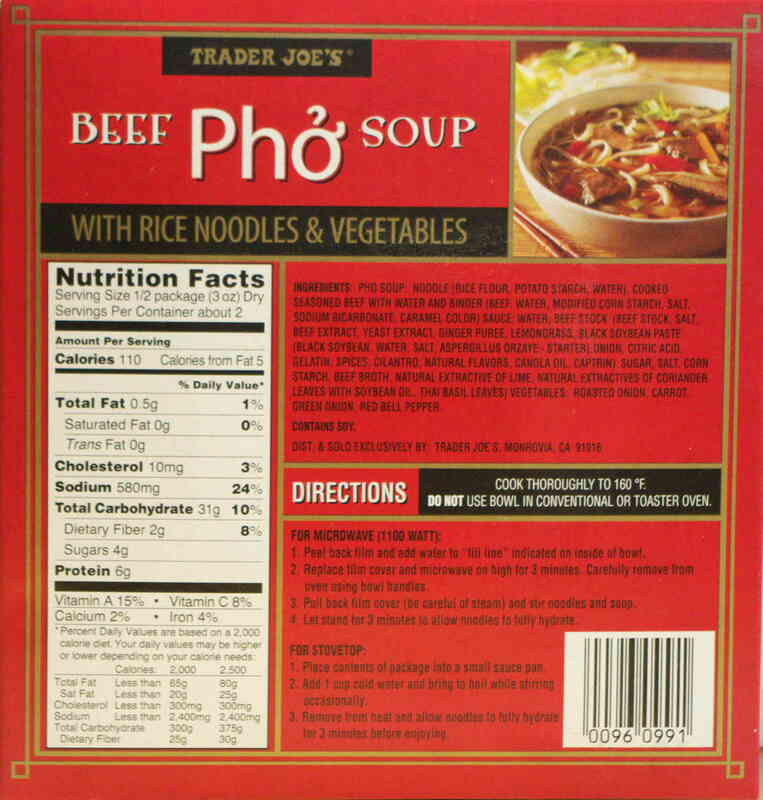 The cause is Trader Joe’s Beef Pho Soup. 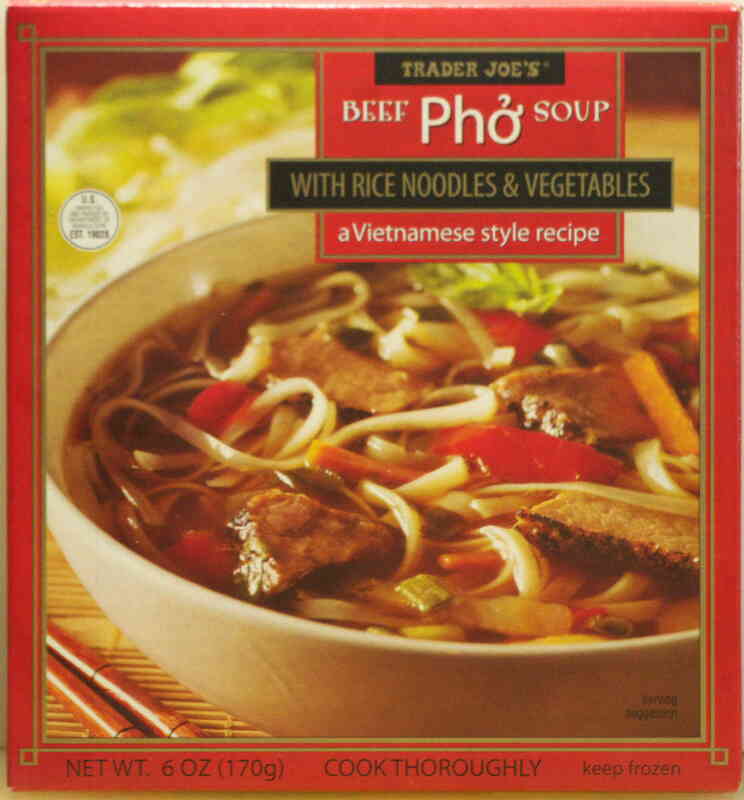 The broth in Trader Joe’s Beef Pho Soup is thin but very flavorful with a little sweet and a little spicy hot twist. There are plenty of tiny flavor bits floating around in the broth. The vegetables are cooked but still crisp. The thin noodles are hard to keep on a spoon, but soak up the flavor of the broth nicely. The noodle eating technique is pretty much get your face in the bowl, push the noodles between your lips and slurp mightily. Very authentic. The beef is chewable, but perhaps could be cut in smaller pieces. However, the beef breaks up fairly easily with the help of the edge of a spoon. The vegetables in the bowl are: scallions, red bell peppers, carrots, onions. When finished, this seems much more filling than its 220 calories per bowl would suggest. The packaging and cooking are a little unique. First, it’s a frozen product, not one of those dry soup bowls. While it’s a frozen soup, there’s no broth in the box. All that’s in the microwaveable bowl within the box are the frozen; beef, vegetables, spices and noodles. You add water and actually cook the ingredients in the microwave in the provided bowl. Three minutes cooking, stir, and three minutes standing is about all it takes. With the wonderful smell coming out of the microwave, it’s a very long 6 minutes. I’d guess this is all done to keep everything fresh and crisp. Whatever the reasons, it seems to work well. There are also directions for stove top preparation. At $2.99 per bowl it’s a little pricey. It’s also a very light lunch if this is all you’re having. If you’re watching your salt and/or carbohydrate consumption, take a look at the back of the box label below. Both are on the high side for so few calories. On the other hand it is a quality product. This entry was posted on 01/02/2015 at 10:40 and is filed under cooking and related items, Recipes, food, cooking and related items, Trader Joe's. You can follow any responses to this entry through the RSS 2.0 feed. You can leave a response, or trackback from your own site.